In what has become typical Arrow fashion, the action for Season 3 is big and the personal drama is even bigger. Team Arrow is facing new villains and new heartache, all while trying to recover from the death of one of their own. In Episode 305, “The Secret Origin of Felicity Smoak,” a cyber attack brings Starling City to its knees, and Oliver (Stephen Amell) and Felicity (Emily Bett Rickards) are pushed to their limits to contain the destruction. And of course, life gets even more complicated for Felicity when her mother, Donna (guest star Charlotte Ross), stops by for a surprise visit. 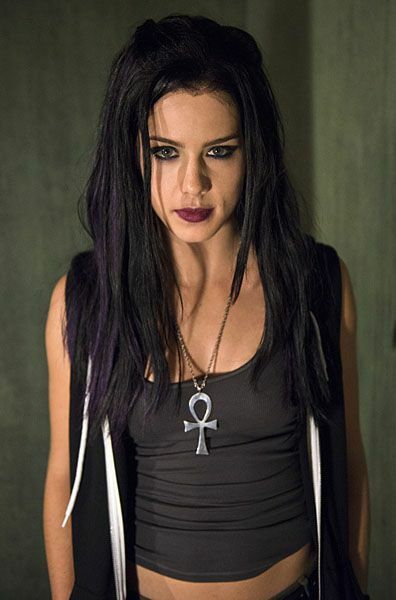 During this exclusive phone interview with Collider, actress Emily Bett Rickards talked about how cool it is to get an episode named after her character, how Felicity’s past turmoil and troubles surprised her, getting to explore Felicity’s goth period, how nobody recognized her in the hair and make-up, Felicity’s college relationship, the dynamic with her mother, the future for Felicity and Oliver, why she needs the fun and light she has with Ray Palmer (Brandon Routh), and the importance of Felicity and Barry Allen’s (Grant Gustin) friendship. Check out what she had to say after the jump, and be aware that there are some spoilers. Collider: How cool is it to get an episode that’s not only named after your character, but where you also get to learn both about her backstory and her present, with her mother showing up? EMILY BETT RICKARDS: It’s a gift. Honestly, it was like being presented with a golden ticket. I don’t even know how to explain it. It’s like the Pandora’s box that you know is going to be great. It’s the utopian Pandora’s box. I feel really lucky and fortunate. I’ve been wanting to know more about it. I can’t get to know more about her, all the time, and I’m craving to know more about her, all the time. It’s hard until you actually get a shot on paper. It’s nice to have her closer to me. What most surprised you about what you learned about Felicity from this episode? RICKARDS: I guess her trouble surprised me. I always look at her as someone who helps me. She just is more wise, and she’s so honest and so present. That’s what she re-solidifies, in teaching me and in teaching all of us, hopefully. I’ve always pictured her a certain way, but then I got to know more of her turmoil and her troubles and I know why now. I know why she’s like that. Felicity has a very specific sense of style in the present. What was it like to explore a very different look for her? RICKARDS: That was awesome for me. It also told me that she went through other phases. She just wasn’t always this person. We all tried things when we were in high school or college. We all grow up at different times, or find ourselves at different times. Felicity finds what her heart is, in the flashbacks of this episode, which is cool. Who in the cast had the funniest reaction to seeing goth Felicity? RICKARDS: This is great. I was dressed as goth Felicity, and we had a sexual harassment seminar with the cast and crew from Arrow and The Flash. There were hundreds of people. I had just gotten off set and was stepping in late, and no one knew it was me. We had to sign a paper and I was like, “No, I was definitely there!” I was trying to say hi to some of my friends on The Flash, who do hair and make-up and who I don’t get to see all the time, and they didn’t know it was me. Nobody knew it was me. That was really fun. It was fun to be in that sort of disguise. The wig was really itchy, really heavy and really hot. I have such appreciation now for actors who have to do that, all of the time. As much fun as it is to transform and have it take you over, it was definitely uncomfortable. It’s like wearing heels on your head. What can you say about her past relationship with Cooper (Nolan Funk), and how was it to play those scenes? RICKARDS: It was nice to experience her in young love. While they were dating, it wasn’t so weighted. It was just about being with this person who fit with her and who matched her personality. They were in college, and it was feisty and lusty. They were discovering and growing together. It ended in a devastating way, which we get to find out about in the episode. What can you say about the dynamic between Felicity and her mother (Charlotte Ross)? RICKARDS: They dynamic is so interesting. I loved playing that because they’re so different. Their energies are just completely different. She’s very electric, and Felicity is definitely embarrassed by her. That’s something that she gets over in this episode, I hope. Maybe not fully, but to a certain extent there’s acceptance. She ends up accepting her mother for who she is, at the end of it, which is what her mother has taught her to do. I think Felicity realizes that the acceptance she has for other people sometimes comes later for the people we love the most, or who taught us that lesson, growing up. I think that’s really important. Will we see similarities between them, or are they glaringly different? RICKARDS: There are definitely similarities in who they are as women and who they are to other people. The nurturing philosophy of what they both symbolize, I find very similar. With things between all of Team Arrow being more intense and heavy since the death of Sara (Caity Lotz), because everything just has more weight now, how will that continue to affect Felicity and Oliver (Stephen Amell) this season? RICKARDS: I think Sara’s death goes deeper than how it just affects Olicity, romance wise. I just think it affects them so deeply, in the sense that death is closer to home than we thought, and we already thought it was really close. Every time someone in your life dies, you realize you’re not invincible and you have to wonder if we’re celebrating life or if we’re mourning a death. I think that takes a lot more energy and thought and care than it does to put it towards the energy of their relationship dynamic. They’re working for a common goal, which can also bring people together, as well. With so many fans rooting for Felicity and Oliver, does it feel like it’s an uphill battle for anyone else that comes into her life? RICKARDS: I think she’s rooting for it, too, but at the same time, she’s not going to pine. That’s where the confusion comes in. As much as she loves him and adores him, he’s got things that maybe she doesn’t want to have to deal with, on a romantic level. As a friend, she might be benefitting him more. When you get involved romantically with someone, sometimes you end up overlooking things that you could help people with better, as a friend. It’s almost sacrificing that, or being a little bit selfish. In the end, it’s about following your own heart. Sometimes that’s hard to listen to. 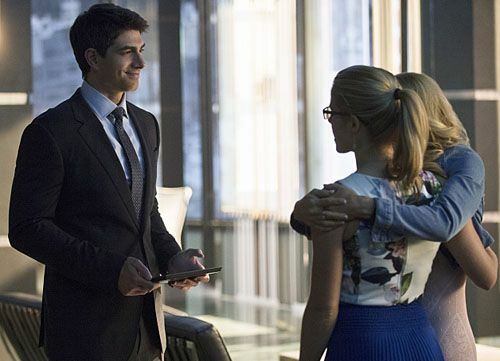 Is it fun to play the dynamic between Felicity and Ray Palmer (Brandon Routh) because they are lighter together? RICKARDS: It’s more fun and light, and there’s not this heavy weight on it, all the time. That’s really important for Felicity right now. As far as she knows, he’s presenting himself as completely transparent, to a certain extent, and that’s what she’s looking for. Felicity and Barry Allen (Grant Gustin) have great chemistry with each other and they understand each other in ways that no one else does. Do you think that will always keep them connected, and keep open the possibility for cross-overs to happen? RICKARDS: I do. I think it will stay open. In a perfect world, they are matched for each other. They even say, “We’re perfectly perfect for each other.” It’s interesting that you don’t always fall in love with someone that you’re perfectly perfect for. But I think it keeps the door open, especially because they need each other as friends. The scenes where Felicity had to talk to and about Sara with her dead body just laying there were just heart-breaking. How difficult was that to do? RICKARDS: Any time we can get Caity Lotz back on the show, I will strive to be in scenes with her. She is one of the most wonderful women I’ve ever met in my life. If I get to act with her, I’m happy, even if she can’t talk to me.